I have started work on a series of paintings and drawings exploring my personal response to that great Australian artist, Brett Whiteley. 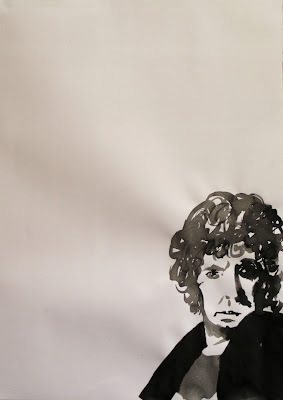 In July 2010 I posted a blog in memory of Brett Whiteley. 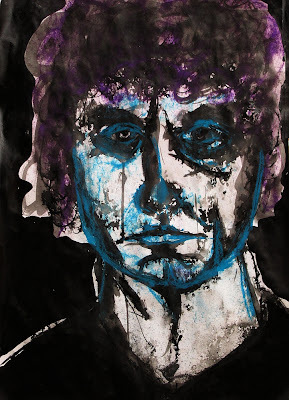 Now that I had had visitors to this blog from 121 countries i thought that this was an excellent opportunity to introduce the amazing Brett to bloggers around the world who may not have heard of him. 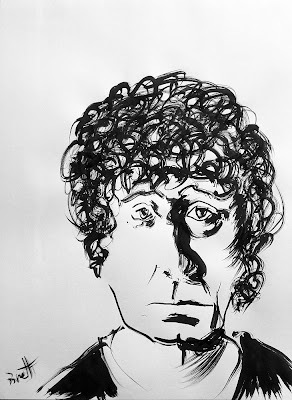 I've commenced my excursion into Brett Whiteley using ink and paper. These are preliminary drawings to get me thinking visually about Brett prior to commencing a series of oil paintings. For paper i am using a cheap 110gsm acid free cartridge paper. 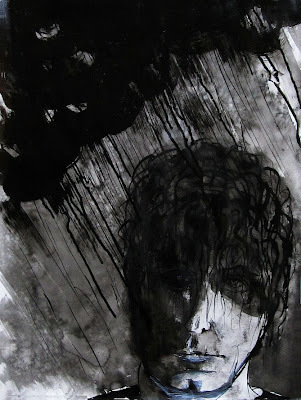 If these sketches start to show any promise, i may switch to rice paper, Arches or Fabriano. For now, i feel i have total liberty and feel dubious about even showing these early explorations in this blog. But hey, we are all visual artists and like to see work in progress. pens love the test of violation". Yes, the great unalterable. I love that ink is permanent. There is no fiddling. It's a 'one-chance' sort of mark-making. It is like a sword thrust - either a palpable hit or a miss. I love that there is no pre-drawing with a pencil. There is no safety net. ("Have you ever seen a pencil drawing that wasn't safe? ", he once asked in a notebook). All my 'errors' are in plain sight. Yet the accumulation of errors can sometimes be so telling, somes so beautiful in their own way. These sketches were made using a reed pen that i made for myself from rushes growing by the Tamar River. I also used a goat hair Japanese calligraphy brush to help me get in touch with Brett. He so loved to work with Japanese brushes in the spirit of Zen. But while i may use the media and something resembling his tools to get 'in the zone', I will not attempt to parrot his style. Brett could do Brett far better than i could ever hope to. All i can do is what i do. In the series i am now embarking upon i don't claim to produce portrait likenesses of Brett Whiteley. Does that matter? (See my discussion of portraiture and likeness here). These works will not be painted from life. They will, in part, be inspired by photos of the man. Does that matter? 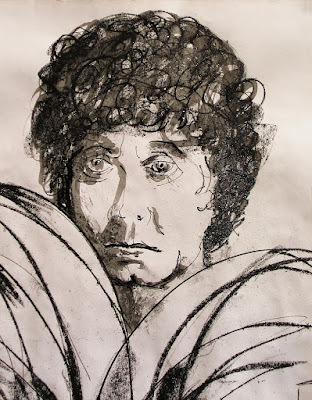 (See my discussion of portrait painting derived from photography here). 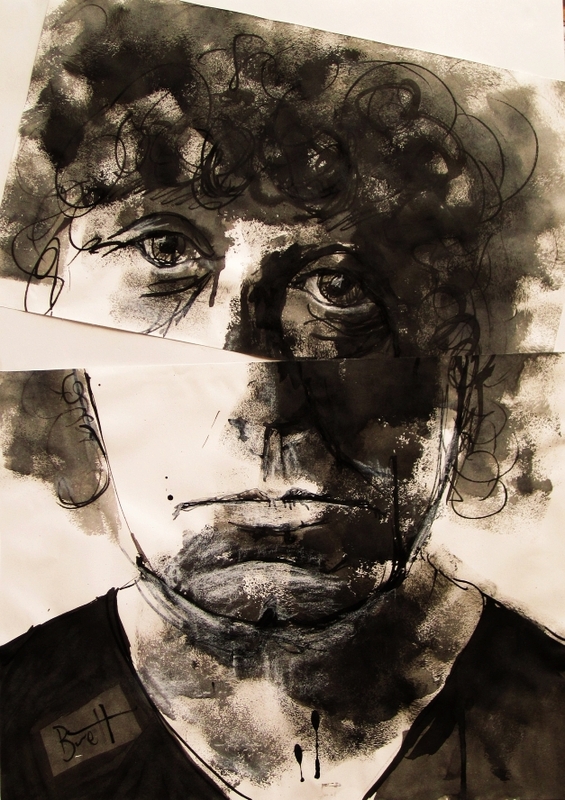 These works aim to be expressive. 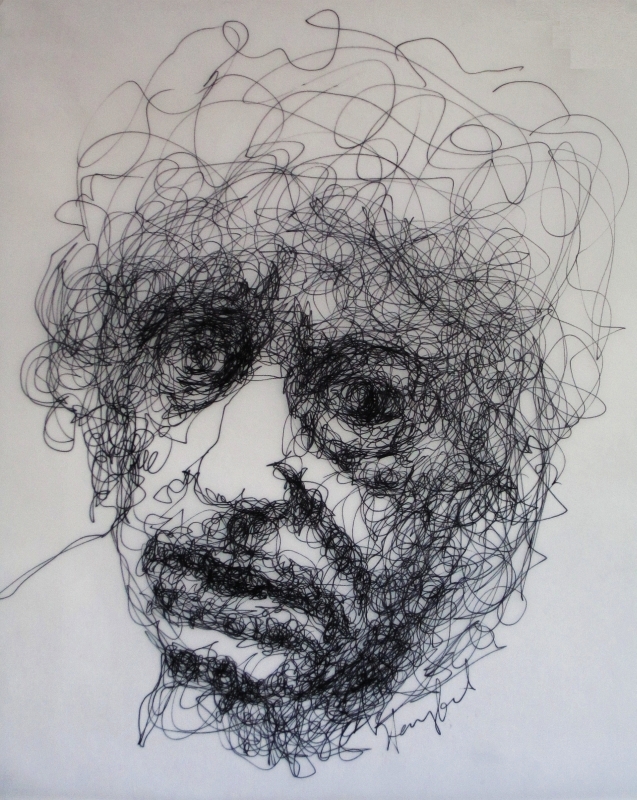 They will be works of my imagination rather than likenesses. They represent what Brettness means to me, what it fires in my own imagination. Initially they will be inspired by his art and by his writing. Ultimately, the images will derive solely from my imagination without reference to anything he has done or any image made of him. They will be about his fate. They will be about suffering, and courage, and the triumph of creative genius over all that binds the human spirit. In essence, i am using photos of him and his journals and biographical information to construct my own 'Brett'. To those who knew him well, my construction may be way off the mark. Which is all beside the point. 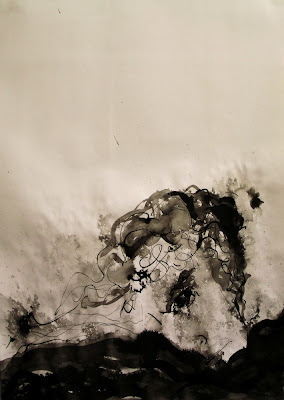 See too my most recent Whiteley ink Apparitions, like the one below, HERE. 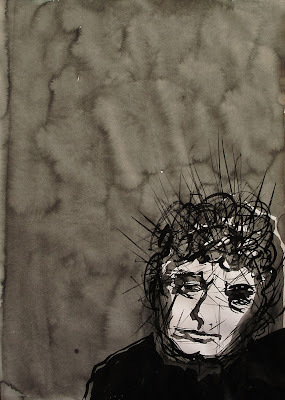 Harry Kent, Brett Whiteley's apparition #4, ink on paper, 56x76cm. For me, the notion of Brett represents something about Australia, about painting, about artists, about critics, about life, love, suffering and celebration, and the questing of the human spirit. My 'Brett' is a symbol, an icon, a talisman. And in this series i am working out for myself just what that talisman means ... with an audience looking on. I've embedded a clip of BW at work and play for those who would like see him in action. what a wonderful post that brings so many thoughts. I am surprised that there aren't any comments yet. Although it's against the rules, but i don't like strict rules anyway, i wanna wish you a wonderful happy new year with lots of new insights, many creativity and muses, new horizons...... And i thank you for your friendship and support. 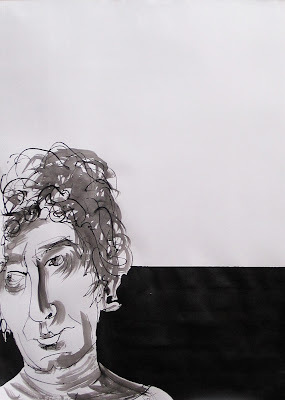 I hadn't heard of Brett Whiteley until now. I vaguely do remember the post you have written in 2010 (i check it out after this comment) And after reading this post i sure am gooing to google Brett for i like the quotes of him. It's a wonderful series Harry and i like how you describe your feelings and thoughts about it, that inspires me to think about all you have written myself.I agree with you that a portrait hasn't to be (bad english?) an exact copy of the model. It reminds of artschool where we had to make portraits of each other in class. I portraited a handsome, selfcentered young man. After finishing it he deminored me: ahhh that looks not like me, such a bad drawing. He had lots of friends (admirerers of his beauty) that confirmed his opinion. How could i draw him that way? As everybody was ready the teacher started talking. She picked my portrait and i felt afraid. "Look at this portrait." she said "it doesn't look like X as in a photograph, but it looks like X a 100%, this is X." My face turned red haha. But it's so true. Only a copy is boring to me, there has to be life in it and emotions. That's why i like your art so much. Your interpretation of Brett makes me curious, makes me wanna know more about him. In the storm is dark and mysterious, my favourite in this series. And now i'm going to check all the links in this post. We are of the same mind, Monica - painting a photo likeness is not the ultimate aim. I understand the sense of achievement that comes with developing good draughtsmanship. I experience that too. But it is not sufficient reason to keep drawing. I understand that in a culture like ours, with the tradition of the Renaissance painting and the invention of the camera, exact similitude to life seems to be the hallmark of good painting. But this is an unschooled understanding. Even a mis-understanding. "Exactitude is not truth." Henri Matisse. Firstly because virtually no artists ever painted 'reality'. All painting is a trick, an illusion, as Gombrich demonstrated. "The object of art is not to reproduce reality, but to create a reality of the same intensity." Alberto Giacometti. Secondly, because there is more to life than the surface appearance of things. Indeed, we regard people who judge others just on the clothes or their hairstyle as shallow. We expect that a mature person is able to read character and make friendships based on personality, not mere looks. Art is no different. For mature people art has to have something to say, something to reveal or a mystery to deepen. "What is real is not the external form, but the essence of things . . . it is impossible for anyone to express anything essentially real by imitating its exterior surface." Constantin Brancusi. 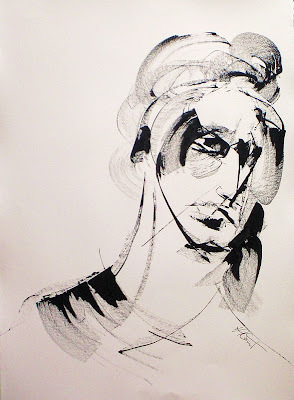 Weak as my talents are, i aspire to the company of Matisse, Giacometti and Brancusi. I don't want to spend my time just practising good draughtsmanship. I have something to say, and in this short life i want to say it before i die, not just copy the work of others who have gone before me. And i know from your art that this is true for you too. Phew, what a ramble. You really got me started there, Monica, hahah. As to why not more people have commented, i expect it's because these drawings are not their liking and they are politely reserving comment. Or it's because the rest of the work is not that excited about a dead Australian artist it has never heard of. Whatever, i'll skip posting more of these explorations until i have some fully worked up oils i am pleased with.